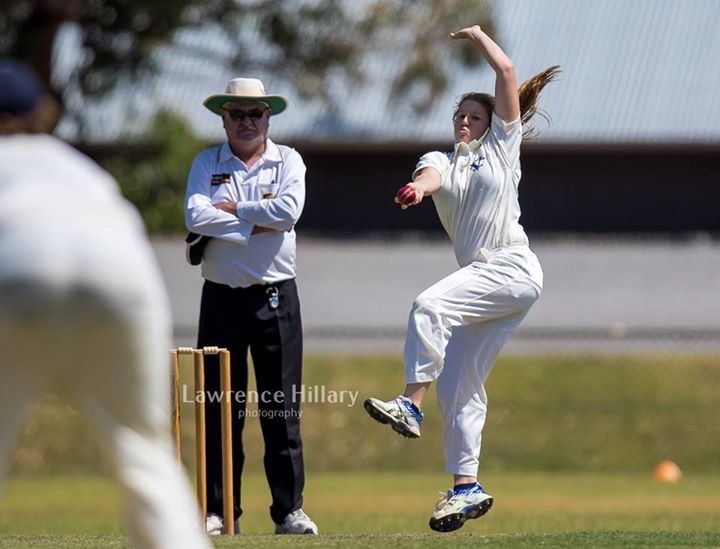 Geraldton cricketer and Mid West Academy of Sport (MWAS) scholarship holder Phoebe Vlahov has a simple philosophy when it comes playing the game she loves: enjoy yourself, and try your best. Judging by her progress so far, it’s a philosophy that works. 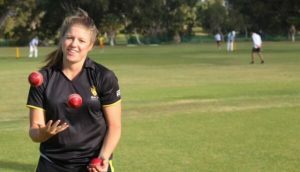 It’s a message she will aim to instil in teammates as a senior member of the Western Australian side heading to the Under-18s Girls Cricket Australia National Championships in January 2016. 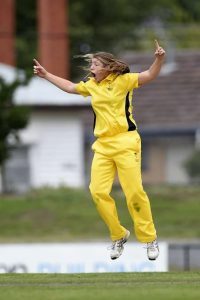 Appearing for her third year, Phoebe is looking forward to testing her medium pace bowling once more against the best players from across the country, with the aim of being named as part of the tournament’s all-star team. Over the year since her last appearance at the Nationals, Phoebe has been gathering awards, achieving highly and making history – all whilst successfully completing year twelve and getting into her chosen course at university. Whilst pleased with the recognition and awards, it is being part of a team that means the most to Phoebe. 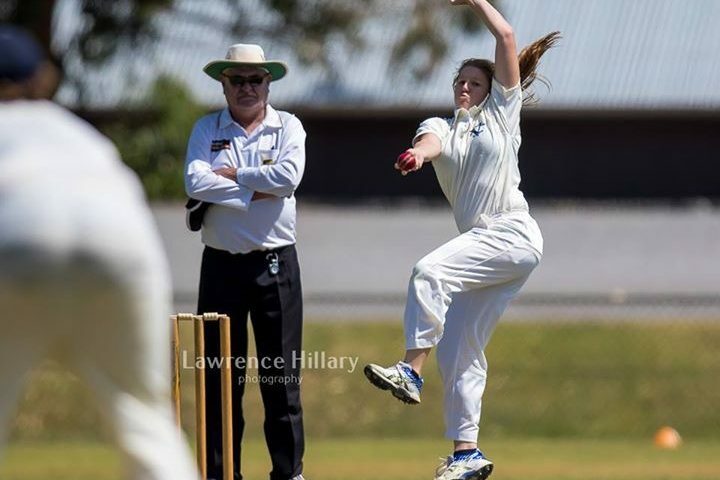 It was the reason she switched four years ago from tennis, after seeing a notice at school promoting trials to join a Geraldton team for the Girls Country Cricket Carnival. Phoebe jumped at the opportunity, and hasn’t looked back. It’s not surprising then that the things Phoebe has learned from playing cricket that have helped her most in other parts of life are all people skills. Working with others, communicating effectively, meeting new people and building networks have been vital skills to master. These have resulted in a great support network that she can draw upon. Capped historic debut for Towns CC in men’s A grade (first woman since the late 80s) with a wicket in her first over! Ask Phoebe which athlete she most admires, and she is quick to name all-rounder Ellyse Perry, the Australian cricketer who starred in the recent win over England in the Ashes. Perry excelled by taking the most wickets and scoring the most runs across the series and has also represented her country in soccer. It’s the way Perry goes about her sport that most impresses Phoebe; her commitment to work hard and continuous improvement. As she prepares for her last junior competition, she is also looking forward to the challenge ahead of continuing to progress through the elite pathway and the possibility of future professional selection. With the rise and popularity of this season’s inaugural Women’s Big Bash League (WBBL), Phoebe says she would like to earn a contract with a WBBL team within the next couple of years, and continues to eye a place in the Western Fury, WA’s state female cricket team. In this goal she feels reassured by the success of current and former state teammates and fellow Junior Taverner’s recipients who have gone on to earn professional contracts such as Nicole Bolton, Megan Banting, and Melissa Cameron, she’s certainly on the right track. The relative lack of media coverage of the women’s Ashes win is indicative of Phoebe’s one gripe about the game: the lack of profile and recognition of women’s cricket, and women’s sport in general. She is disappointed too that women can’t focus 100% on their sport due to having to have a job as well. Phoebe hopes the WBBL will showcase the talent and build excitement in women’s sport to grow opportunities for full time professional contracts. Ironically, Phoebe credits the lack of a local women’s cricket competition to date as an unexpected advantage for her skills development. For now though it’s all about the Nationals, as Phoebe joins her state teammates to train before they head to Canberra for their first match on 13 January. With the backing of the MWAS, the WACA, and her own self-motivating enjoyment of the game along with the drive to perform at her best, the future looks bright for Phoebe Vlahov.& conditioning program, which has helped increase her power and prevent and manage injuries. The nutrition seminars and sports psychology program have also proved invaluable. The complete package of the support network surrounding her is both welcomed and highly valued. It is anticipated her third year with MWAS may also include mentoring younger scholarship holders to help them make the most of the program. Photo credits: 2. Matthew Woodley and 3. The Courier, Ballarat.